Esben was now put into a little dark hole, where he saw neither sun nor moon, and there he was fed on sweet milk and nut-kernels. The daughter had enough to do cracking nuts for him, and at the end of fourteen days she had only one tooth left in her mouth; she had broken all the rest with the nuts. In this time, however, she had taken a liking to Esben, and would willingly have set him free, but could not. 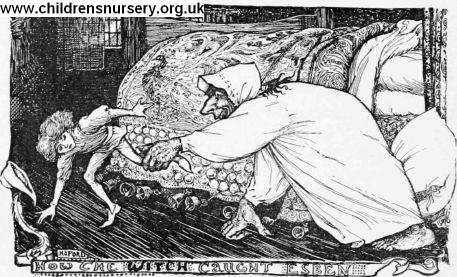 When some time had passed the witch told her daughter to go and cut a finger off Esben, so that she could see whether he was nearly fat enough yet. The daughter went and told Esben, and asked him what she should do. Esben told her to take an iron nail and wrap a piece of skin round it: she could then give her mother this to bite at.